What’s worse than being in a car accident? Being in a car accident when you’re not in a car. And what’s worse than that? When the perpetrator nails you on the road and runs off, only to hop online and brag about it. It may have just been a short tweet, but that doesn’t mean there isn’t a lot to dive into here. 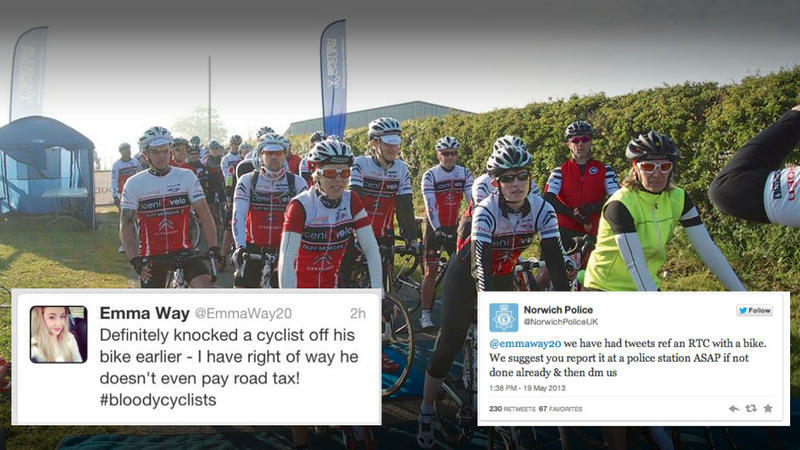 First, Emma sweetie, a hit-and-run is against the law in Norwich, England, where you fled the scene. Second, if you’re going to revel in committing a crime, using a social media account with your real name on it may not be the smartest move. Third, take another look at the previous two sentences, because your local police are super interested in you now. The bicyclist who got clipped was taking part in a 100-mile race at the time. According to an eye-witness account, a driver was zooming around the corner just as Toby Hockley, 29, was pedaling the other way. When she sped by, her mirror hit him and sent him flying into the trees. At this point, most people would be horrified, but not Way. Her only emotion seemed to be irritation that this man was in her path. It was a stroke of luck that Hockley didn’t sustain any serious injuries. And let’s hear it for the Twitterverse: Seems that the Norwich Police department was tipped off by other Twitter users who were appalled at the belligerent tweet. Public outcry is a powerful tool, people. Way had to pull her Twitter account over the matter, and when onlookers, intrigued by this incident, went looking into her other social media accounts, they found photographic evidence of her other road safety fails — including tailgating other drivers and speed readings topping 95 MPH. Needless to say, these pics were all forwarded to the police. Had Way kept her tweet-hole shut, she would’ve gotten away with it. Hockley wasn’t even going to report this, but changed his mind when he spotted her attitude.